American numismatists have been blessed with extensive record keeping by the United States Mint. We know almost exactly how many coins were struck for any particular issue, even as specific as to the month, or even the day. This is unlike many other countries where such records were never kept or lost, making rarity determination much more difficult. Due in large part to these extensive records, we are able to determine the rarity and some of its causes for a number of intriguing issues, such as the 1878-S Seated Liberty Half Dollar. The half dollar was one of the most popular denominations for much of the 19th century, struck virtually continuously at various mints in large quantities. The San Francisco Mint had struck approximately 5.3 million half dollars in 1877, yet the following year saw the creation of a rarity. The unique story behind the coin can be uncovered by examining the records available from the Mint and in particular the surge in production for the silver dollar. Silver dollars had last been struck for circulation in 1873, when they had been replaced with the Trade Dollar, solely meant for use in overseas export. The whole situation would change again with the Bland-Allison act of 1878, which required the United States Mint to purchase a certain amount of silver each month and mint it into silver dollars. The act had been passed after extensive pressure from Nevada, where the mines of the Comstock Lode were still turning out a huge supply of silver. When the Bland-Allison Act of 1878 passed it meant that all mints (Philadelphia, San Francisco, New Orleans and Carson City) had to turn out huge amounts of silver dollar each month. The massive increase in silver dollar production had a significant impact on the production of other silver denominations which saw their mintages drop dramatically for the next decade. The total output of the 1878-S Half Dollar was a mere 12,000 coins, or approximately 0.2% of the previous year’s mintage. After this meager production, no more Seated Liberty Half Dollars would ever be struck at the San Francisco Mint as production would be focused almost solely on Morgan Silver Dollars to fulfill the requirements of the Bland-Allison Act. From the original mintage of 12,000 pieces, only a small portion are currently known to exist across all grades, with the most generous estimates indicating 60 surviving examples. 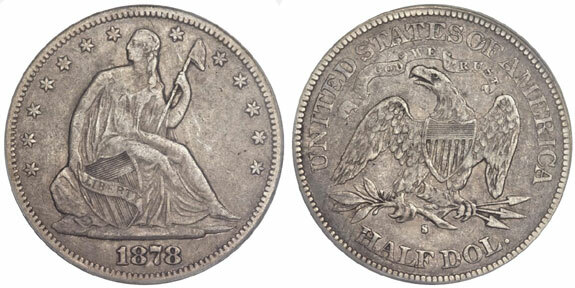 The low survival rate for the issue can be attributed to the location San Francisco (in the Western United States, close to the frontier) and the popularity of the half dollar denomination in both domestic as well as foreign trade (the Trade Dollar, introduced in 1873, was solely made for that purpose although the half dollar was a popular denomination in export as well). The above factors resulted in heavy circulation in addition to the number of pieces which were melted or lost over time. One should also remember that there were virtually no coin collectors in San Francisco in 1878. This meant that once a coin entered circulation, it was very unlikely to be pulled out of it and put into a coin collection. This is also the reason that most of the known specimens of this rarity are either well circulated or in uncirculated condition. Among the surviving specimens of the 1878-S Half Dollar, there are a few high grade examples that are periodically available to collectors. These offerings are infrequent and highly competitive due to the popularity of the series and collecting coins of the San Francisco Mint in general. The finest known example of this rarity has been graded MS-66 by PCGS, followed by an MS-65 and two coins graded MS-64. One of the MS-64 specimens, a completely original coin with excellent eye-appeal, sold for $184,000 in April 2009. The same coin carrying a CAC sticker of approval later sold for $199,750 at an auction held in June 2014. At the lower end of the spectrum, a well circulated piece graded PCGS AG3 recently sold at auction for $19,975. A bit further up the scale an example graded PCGS VF30 realized a price of $49,937.50. Among the infrequent offerings are also some examples which have been improperly cleaned or show other impairments. Despite their flaws, even these coins drive strong prices due to the overall low number of survivors for the issue.